This is a weekly series that aims to preview upcoming Regional tournaments, review Regional tournaments that have just taken place, highlight winning decks, interview players, and more. Last week's article was The Road to Worlds 2013, Week 8. How can you contribute to this series? First and foremost, I am relying on results and deck lists being promptly entered into this site. I can't write about them otherwise. Other ways you can help include: taking photos, interviewing players, writing previews, and providing background information. Any other way to help the community be a part of your Regional tournament would be appreciated, too. Contact details are at the end of this article. Tjark's Place (Second Edition): This Vandros IV Regional was the first of four double-headers being held on Saturday. Five players participated in four rounds of action. Everyone's pick to win; Thomas Schneider (thsch), playing a Romulan deck titled "Fighting the Curse"; felt the weight of expectations and suffered a loss in round one to Florian Ott (h3on), playing a Borg deck titled "The Borg are so interconnected it would act like a virus". In a close game, Thomas had to use Power Shift three times (spending 15 points to do so) at his final mission, and then ended up losing the game 60-70. Florian followed this modified win with two more modified wins and a full win to claim the Regional title, his first in five attempts during the Continuing Committee-era. Other affiliations played include Earth Space 9, Non-Aligned and Voyager. All five deck lists and two tournament reports can be found on the tournament results page. 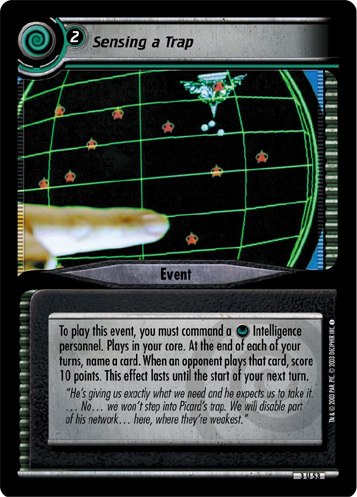 Tjark's Place (Tribbles): All five players remained to play this Vandros IV Regional. Father and son Tjark Ott (tjark) and Florian Ott (h3on) both appeared to be playing Go / Discard and carved the tournament up between them. First, Florian went out in round one, then Tjark did the same in round two. Then Florian went out again, and Tjark did the same. Florian then took the upper hand by taking the fifth round. Or so he thought. With both players scoring just under half a million Tribbles, they ended up being separated by just 1966 Tribbles - in Tjark's favor. Neither player won the tournament though. Thomas Schneider (thsch), playing a Poison deck titled "Thank you! ", won the tournament. Having only scored the pity Tribble at his last two tournaments, Thomas built a deck that could score him points. It was primarily based around Poison, but also contained Toxin, Score, Utilize, and Tally powers too. They did the trick, and Thomas outscored Tjark by 135,857 Tribbles to take the title, his first Tribbles Regional title. One deck list and one tournament report can be found on the tournament results page. Lakewood Public Library (First Edition): Ten players descended on Lakewood, Ohio for the First Edition and Second Edition Regional double header. Seven players participated in the first tournament. After three rounds, Matthew King (kingmj4891), playing a Ferengi deck titled "Ferengi Fruit Snacks", was undefeated and won the title. Matthew's third round opponent Sean O'Reilly (Jono), playing a Borg deck titled "Borg will assimilate your TNG homeworld 2.0", reports that the result could have been different. With the score at 92-90 in Sean's favor, Sean could have returned his Sphere to hand. Instead he left it on the spaceline and Matthew attacked it for the final 10 points he needed to win. Sean reports he would have solved his final mission on the next turn, to win the game and the tournament. (Depending on your view) Tough luck Sean and/or congratulations Matthew! John Veasey (elveez), playing a Romulan deck titled "back in green2", was one of three players with just one loss and took second place as a result. Other affiliations played include Federation, Ferengi and Klingon / Starfleet. Six deck lists and three tournament reports can be found on the tournament results page. Lakewood Public Library (Second Edition): Seven players took part in the second Regional of the day in the Qo'noS Region. Jared Hoffman (Mugato), playing a Dominion deck titled "Dead Giveaway", was undefeated over four rounds and won his second Regional title in a month. Behind him, two players had just one loss: James Booker (Shooter McGavin), playing a Next Generation deck titled "Tobias likes REM, I figured he liked the Scorpions"; and Derrick Marsh (HoodieDM), playing an all-printable Cardassian deck titled "Stolen Cargo Ship". James and Derrick faced each other in round one. Derrick struggled to draw into a ship though, and James won 100-10. That was enough to give James second place overall, and Derrick took third place - in what was his second ever Second Edition tournament. Other affiliations played include Ferengi, Klingon, Next Generation and Dominion / Ferengi. All seven deck lists and five tournament reports can be found on the tournament results page. Jagerhaus (Second Edition): The first part of the third double-header of the day attracted seven players in this Andoria Regional. Two of those were North Dakotans invading South Dakota for the day. Heading into the third and final round, any one of four players - two from the North and two from the South - could have taken the title. It all hinged on the game between Kevin Jaeger (Hoss-Drone), playing an Earth Space 9 deck titled "Jackie Treehorn Presents: 1 Ship, Two Bangs"; and Matthew Hayes (karonofborg13), playing a Next Generation deck titled "A Tale of Two Matthews...A Frid Deck with a Hayes Twist". If Kevin avoided a loss, he would win the tournament. If Matthew took the full win, he would win the tournament. If Matthew took a modified win, four players (including Kevin and Matthew) would end up needing tiebreakers to decide the winner. As it was, Kevin won the game 100-45 to take the title - his seventh Regional title in the Continuing Committee-era - for South Dakota. Chris Volk (volkerii) took second place with a Non-Aligned deck unimaginatively titled "Non-aligned", while Matthew's loss left him in fourth place overall. Other affiliations played include Cardassian, Klingon, Relativity and Next Generation. Five deck lists and one tournament report can be found on the tournament results page. Jagerhaus (Tribbles): The second half of the South Dakota vs. North Dakota battle saw six players participate. Chris Volk (volkerii), invading from the North, was victorious with his Go/Clone/Battle deck titled "bait and switch". Chris scored 1,300,534 Tribbles, which works out as 59% of all the Tribbles scored at the tournament. Incredibly, this is the third Tribbles Regional Chris was won this year with the same deck. Congratulations Chris! Mike szarmach scored 528,717 Tribbles to take second place by a considerable margin from Nate Lindgren (Methos), with 203,221 Tribbles in third place. Two deck lists can be found on the tournament results page. Tyler's House (Second Edition): Six players fought it out over four rounds for the title of The Void Regional champion. Going into the final round, Tyler Fultz (DJstormtrooper), playing a Next Generation / Deep Space 9 deck titled "Can't Stop- Won't Stop (Regionals Edition)", was undefeated and leading the way. However, two modified wins and a full win mean that two other players still had a chance at taking the title if he should drop points in his final game. That game was against John Corbett (KillerB), who was playing a Klingon deck titled "Kruge should cost 5". At Tyler's first mission attempt, John killed two of his six (mostly un-killable) personnel with dilemmas. John then flew over on his next turn to steal the ship with Kruge. Tyler never recovered from that setback, and John took the game. That meant that the other Klingon player, Jim Sharp (jss_hobbie) whose deck was titled "This is the Regional??? ", would win the tournament with a full win in his final game. He did just that, and defended the title he won last year. John finished in second place, and Tyler was third. Jim writes in his tournament report that he thought this tournament was a warm-up for the Regional, and he would have played a different deck had he known it was the actual thing. As the only person to predict Jim would win, I'm glad he got it wrong! Other affiliations played include Original Series, Relativity and Starfleet. Four deck lists and four tournament reports can be found on the tournament results page. Tyler's House (Tribbles): With the other players apparently unable to persuade John Corbett to play Tribbles, five remained to battle it out for this The Void Region title. Tyler Fultz (DJstormtrooper), playing a Battle/Bonus deck titled "Battlefield Conversion", won the title after going out in round three with over half a million Tribbles in his score pile. With multiple Bonus points scored over the five rounds, he finished with a score of 901,076 Tribbles. Gerhard Hallgren (Psi Limit) scored 402,024 Tribbles to take second place with his Poison/Replay deck titled "Poison", while Jonathan Engel (Triumph) - who took great delight in reseating everyone three times - finished in third place with a score of 160,202 Tribbles. Four deck lists and two tournament reports can be found on the tournament results page. Good Games Burwood: The highest attendance of the weekend occurred at this Second Edition Kazon Collective Regional, where eleven players participated. After four of the five rounds, all the players had suffered at least one loss, so three players were in contention for the title: Steve Hartmann (chompers), playing a Bajoran deck titled "The course the Prophets choose for us may not always be comfortable. But we must follow it - Winn Adami", who lost in round one; Shane Brierley (Shanebrier), playing an Original Series deck, who lost in round two; and Jay Coad (jayzilla), playing a Klingon deck titled "Klingon solver v3", who had just lost in round four. Steve and Jay played each other in round five knowing that a full win for either player would result in the title. If they both dropped points (via a modified win or a true tie), then a win for Shane in his final game would see him claim the title. As it was, Shane won his game and Steve beat Jay 100-30. That meant that Steve won his first-ever Second Edition title, Shane was second, and Jay ended up in fourth place. Other affiliations played include Ferengi, Klingon, Relativity, Starfleet, Next Generation, Voyager, Klingon / Romulan and Relativity / Voyager. Five deck lists and four tournament reports can be found on the tournament results page, and an interview with Steve Hartmann is below. This week, Steve Hartmann (chompers), winner of the Kazon Collective Regional with a 115 card Bajoran deck featuring Borg cards talks us through his day. James: Congratulations on your win Steve. Let's go back to the beginning, which decks you were considering playing? Steve: It was either a Cardassian solver similar to what I played at Worlds, or an untested Deep Space 9/Romulan deck also using Quintessence, or Bajoran Quintessence. I decided to go with Bajorans because I have a lot of fun playing them. James: What decks did you expect to face? Steve: Borg, Klingons and Voyager always turn up at our Regionals. It was a big surprise that Borg was not played. James: Can you describe how your deck works? Steve: Here is the deck list. The goal is to discard the deck as quickly as possible using Quintessence(s) and Find Lifeless World. Quintessence increases hand size at start of turn which helps set up Find Lifeless World. Once discarded, use all of the tricks that trigger off of the discard pile. James: Are there any special tricks or combos in the deck? Steve: There are a few and it is rare that they all get going each game. Two of my favourites include: Odo kills Ranjen Koral, Xhosa retrieves Ranjen, Ranjen retrieves Covenant; and Bareil Antos sets up the dilemma pile by retrieving Rule of Acquisition #141 for Gorgan or the Borg Ships for Tactical Disadvantage. James: It sounds like Quintessence is critical to the deck working. How on earth do you manage to get it into play with a 115-card deck? And, how reliably can you get it out? Steve: If I don't draw Quintessence I rely heavily on Find Lifeless World. Quintessence can also be downloaded with If Wishes Were Horses. There are options to retrieve it it gets discarded or destroyed (Ranjen Koral, Souls of the Dead). Other ways to quickly burn through the deck include Bajoran Gratitude Festival and Days of Atonement. I had Quintessence out by turn three in all of my games but one, and two copies in play in my game versus Kieren. In my game against Chris, I struggled to get it out and this was easily my worst draw. I was lucky that the Bareil/Rule of Acquisition #141/Gorgon trick got going which bought me a few turns. James: You played your "hastily thrown together" Bajoran deck last month in Hurstville. What did you learn about your deck from that tournament? Steve: The main difference was getting synergy between the draw deck and dilemma pile. Adding copies of Gorgan, Tactical Disadvantage, Borg Ships and Rule of Acquisition #141 helped a lot. I hadn't considered how well Bareil could set that up. James: How did this week's Regional play out? Steve: I would have tipped Jay to win this event, as I had previously faced his Klingon deck, and he was looking good after round three. In our game Jay had a terrible opening hand drawing into four of his ships whilst I started with Surprise Party and Quintessence. Shane and I both finished equal first on four full wins and a loss having not faced each other. Shane was playing an Original Series integrity deck using the low integrity missions, and if we had played it would have been a very tight match that could have gone either way. Matt Ting was playing with Sensing a Trap which I had tried as a counter to Relativity when it first came out. It is somewhat ironic that his build only lost once all day to a Relativity deck. James: Who was your toughest opponent? Steve: Matt's deck shut down a lot of my options as he stopped me from playing Dukat, Basso Tromac and Covenant. I was able to get around his copies of Sensing a Trap to some extent with Xhosa, Borum, Find Lifeless World and Quintessence. In the end the game really got bogged down with both of us chewing up the clock with all of our various actions. James: Now the tournament is over, how would you improve the deck? Steve: I would make both the draw deck and the dilemma pile smaller. I’d get rid of Christening and Hidden Resource and add a third copy of Rule of Acquisition #141. I might also try and set up Gorgon recursion with The Trial Never Ended. James: At the end of your report, you question whether you should combine the deck with Qo'noS for Guidance of the Council. When can we expect to see that monstrosity? Steve: No Qo'nos, just Guidance of the Council. Increasing hand size (for Find Lifeless World) is critical to making this deck work as is placing the right type of personnel that cost 4 or more in the discard pile. Guidance makes that happen. I am in the fortunate position that I just acquired a third copy of Guidance so it may well happen soon. James: If you could create an achievement, what would it be? James: Do you have anything else to add? Steve: It feels wrong using Borg in a Bajoran deck. Thanks to Steve for answering my questions. These bye winners have been added to the list of current bye winners for the Continental Championships and the World Championships here. For everyone who didn't win a bye, there are now only 29 Regionals where you can earn one. The Road to Worlds 2013, Week 9 continues in part II.